It’s the birth date of T. S. Eliot (1888-1965), Old Possum’s Book of Practical Cats. Johnny Appleseed (1774-1845), born on this day as John Chapman in Leominster, MA, was a pioneer Nurseryman and American legend. Read Johnny Appleseed by Reeve Lindbergh, illustrated by Kathy Jakobsen, Johnny Appleseed by Jane Kurtz, illustrated by Mary Haverfield, and Johnny Appleseed by Steven Kellogg. It also happens to be Johnny Appleseed Day. It’s Family Day—A Day to Eat Dinner with Your Kids. Read All-of-a-Kind Family by Sydney Taylor, and Dinner Time by Jan Pienkowski. From September 22 through September 28, the American Library Association celebrates Banned Books Week. Often your local public library will display some famous banned books. I am always surprised to see what makes list of “top banned/challenged books” of the decade. Harry Potter leads the list—possibly Harry Potter is going to lead all lists (sales, censorship, and box office). But number 2 seems to me almost impossible: Phyllis Reynolds Naylor’s series about Alice McKinley. Phyllis won a Newbery Medal for her much beloved Shiloh in 1991. But in 1985 she began publishing an even more popular group of books beginning with The Agony of Alice. When we meet Alice in sixth grade, she has just moved to a new neighborhood. She has a loving father, a single parent because her mother died when Alice was five, and an older brother, Lester. Like many middle schoolers, Alice thinks and worries about everything. She is often mortified by her own behavior—including bad poetry that she wrote in third grade. Overly sensitive, she tries to fit in at her new school. But she does not like her teacher and even tries to get her classroom changed to be with the teacher she admires more. A refreshing blend of daring and cringing, Alice successfully bumps her way along until the end of sixth grade, when she comes to adore her teacher and has gained a boyfriend. Relationships and feelings stand at the core of these books. But Naylor is completely frank about details of life such as getting a first bra and having your first kiss. Since Alice goes through high school in the series, she encounters, of course, more complex issues. All the issues have been woven easily into the narrative, but it gives young readers a place to go for information in the event that they feel that they can’t ask certain kinds of questions at school or at home. I suppose this honesty about the human body has caused the books to be banned. All I know is that if a young girl needs some answers to life’s questions, she can gain a lot of insight from one of the great ladies of the book world, Phyllis Reynolds Naylor. Naylor, in fact, has said that to her Alice is the daughter she always wanted. 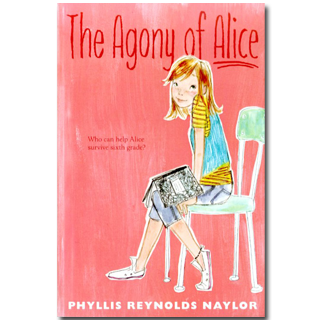 Young readers, age eleven to fourteen love these books because they identify with Alice—her awkwardness, her hopes, her dreams—and they also appreciate the wise advice about personal issues. So for those who haven’t read these books, pick them up during banned books week and make your own decision about their merit. In my forty years of experience, the children’s books some attempt to ban are just the books that others cherishes most. When I got home, my brother’s car was parked out front. I went inside and back to the kitchen to feel around under the bread for potato chips. Lester always hides the things he likes. After I found those I looked under the lettuce in the refrigerator for the dip. Once you know Lester’s system, you can find almost anything. I had just started down to the family room with my snack when I heard a girl’s voice upstairs. I stopped there in the hallway. The sound came again, the sound of a girl laughing in Lester’s room. Something told me that Lester wasn’t supposed to have a girl in his room. Not with the door closed, anyway. Not when Dad wasn’t home. Originally posted September 26, 2011. Updated for . Libby Hathorn is still with us and contributing to children’s literature in Australia. She did not pass away in 2003 as you have stated above. See her website http://www.libbyhathorn.com/. Victoria: Thanks for the correction; happy to hear this. I have changed the entry. The cover art on the book above so appeals to the 12-year-old me!. I wasn’t aware that these books had been banned. In my mind, that’s all the more reason to read them! I picked one of these up at the library a while back and stood there reading it as my girls played and chose books. I was totally charmed by it! Now that I know the books are banned, I’m going to make sure I buy the whole series so my girls have them to read when they reach that age. Star: What a great response for banned books week. These are exactly the kind of books we always want to have around. I was creating a banned books display yesterday and was surprised to see this series on the list as well. So many books have been banned or challenged due to language, violence, and/or drug use – none of which characterize the Alice series. No, instead it is due to the series’ “honesty about the human body”, as you put it, which I think is the silliest among these reasons to ban a book. Why keep kids/pre-teens ignorant? It was so interesting to look at the list of the Top 100 Challenged/Banned Books and see so many of the books that were most popular in my former 8th grade English classroom (The Perks of Being a Wallflower, Go Ask Alice, Killing Mr. Griffin, What My Mother Doesn’t Know, Speak, etc.). These books were such a success with my students, and they weren’t even aware they were “banned books.” I can only imagine this would have increased their allure. I think you got it right when you described Alice’s appeal; my students and other adolescents enjoy both characters they can relate to and stories that can answer the questions they feel they don’t have anyone to ask. I *loved* the Alice books as a young girl. You’re absolutely right — these books helped me deal with (and laugh about) my own awkwardness and questions I was too shy to ask anyone. I took this recommendation and got one for my daughter, Laura, who is in Grade 5. We read the first several chapters this evening and were laughing so hard, we both had tears in our eyes! She can’t wait until she’s in bed tomorrow night to continue! I’m thrilled with it and we look forward to reading others in the series. Laura is reading Shiloh in school and is not enjoying it because it’s so sad and she doesn’t want to cry in school. I’m sure she’s going to tell her reading group that Mrs. Naylor also writes funny books. Thanks for having such a wonderful site! When I began writing for a middle grade audience (at the suggestion of a very wise editor), it was suggested to me that I pick up the Alice books for research. I read the first several, (along with the Judy Blume favorites from my childhood) to help me get the voice and issues of a young girl just right. I’ve been a very big fan ever since. I think I’ll pick up a Honeycrisp apple today in celebration of Johnny Appleseed’s birthday. Who knows, maybe I’ll go crazy and make an apple crisp. Thanks for bringing the Alice books to my attention. I didn’t know about them. My local library branch has The Agony of Alice on the shelf, so I’m picking it up when I go this afternoon (on my way to getting some apples). Always looking for good realistic fiction to recommend.